Guest reviewer Jacqueline Brown joins Maribeth Clemente (and her boyfriend) on their cycle ride across France in A Tour of the Heart. Sometimes there are books you pick up that just click – it could be writing style or subject matter, or both. 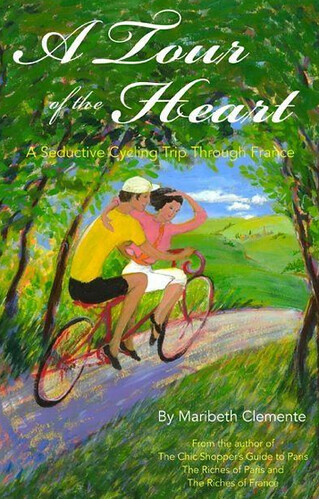 A Tour of the Heart: A Seductive Cycling Trip Through France was one of those books for me. Yes, it is set in France and, yes, travelling and cycling are involved, but it is more than just a cycle tour of France book – it has the added the emotions of a good chicklit in it too. From the beginning I loved Clemente’s style, the descriptions of the areas they visit and their meals transported me from the cold foggy winter into the delights of holidaying in France. Although I will admit to being insanely jealous of the doors that opened to her because of her status as 'journaliste americaine'. The book is set in two parts, the first part is their journey through France; the second is about their return to cover the 2001 Tour de France. Set at the height of Lance Armstrong’s fame (things have a different edge to them now), she certainly portrays the hype and excitement of the time. This is probably not the book for you if you are looking for a book on cycling in France, as, like her companion Pete, you may find there is not enough actual cycling in it. However Clemente is a travel writer who has a real love of France, so it is no surprise that her descriptions of France, the places they visited and the food they tasted stayed with me long after I finished reading this book. A Tour of the Heart: A Seductive Cycling Trip Through France by Maribeth Clemente is available as an ebook and in paperback. Jacqueline runs the excellent French Village Diaries blog. This review first appeared on her blog. Jacqueline and her family like nothing better than packing a picnic and setting off for the day to follow one of the many marked bike routes around the French countryside.